Another week, another bath, another book from Santa, and this week I was devouring Lynn Harris’ book Every Last Piece. Now I have a confession to make – I rarely read the intros to sewing books, they’re usually things like ‘this is how to get a 1/4″ seam’ and I’m guilty of assuming that I know it all, so I flip through to get to the ‘good bit’ with the patterns. With this book I actually read the intro, as it was more a tale of why and when than a how to guide, and it was interesting to read the inspiration behind the book. It was also interesting to learn of Lynn’s dumpster diving habit at retreats – I confess that I have been that dumpster diver too, not least because some people chuck out big bits of fabric and I can’t bear to see them go to waste. Clearly a book speaks to you when you have multiple confessions and you’re not even past chapter 1! 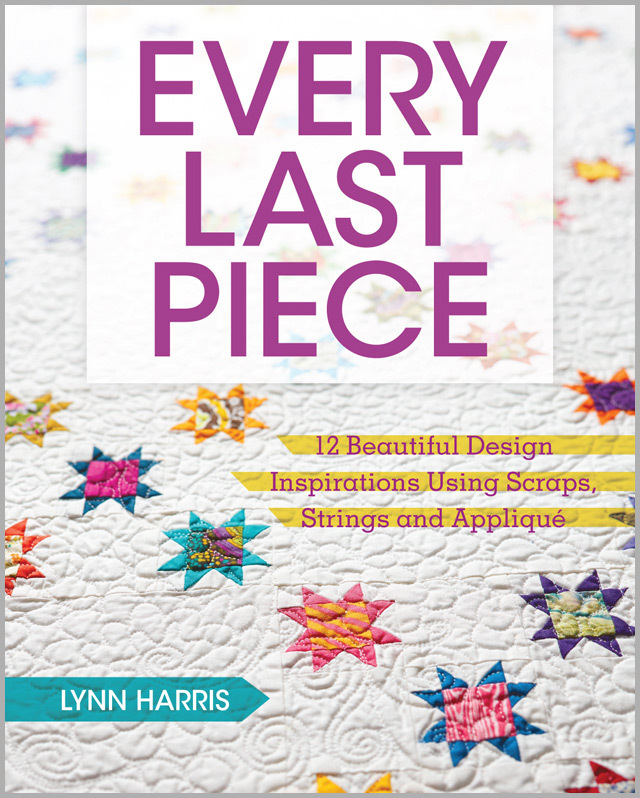 There’s a lovely gallery of quilts that Lynn has made near the start of the book, and now I know that should I ever happen to be passing by, which ones I’d like to add to my collection – the one on the front cover will be the first one I go hunting for! If you read the book and want to partner up on this, one of us can distract her while the other makes for the quilts, okay? The nice thing about the subsequent sections of the book is that it takes you through how to cut and piece different styles of block, and how you can mix and match techniques to create different effects. There are also diagrams at the end of each chapter suggesting what traditional blocks would look good with the chosen effect. It’s got me itching to break out my scrap bags, I had ideas shooting off like fireworks! I really can’t wait to get to a project based on this book, if someone can just write a sick note for my boss? Perhaps for string fever, or scrapitis, I don’t mind, extra points for inventiveness! Elsewhere it’s available from Amazon and other good booksellers. Feeling overwhelmed by my scraps tbh. Too many ideas and no energy or hope of that much time! I am sure that you are definitely suffering from a severe case of scrapulosis, the acknowledged remedy is a month away from work with nothing but a bin bag full of scraps and your sewing machine for company!